The 10th Missile Squadron is a United States Air Force unit. It is assigned to the 341st Operations Group, stationed at Malmstrom Air Force Base, Montana. The squadron is equipped with the LGM-30G Minuteman III Intercontinental ballistic missile, with a mission of nuclear deterrence. Established in 1939 as a prewar bombardment squadron, it was equipped with a mixture of Douglas B-18 Bolo medium and early-model Boeing B-17 Flying Fortress heavy bombers. It trained over the US east coast flying training missions. It also had some second-line Northrop A-17 Nomad dive bombers assigned. After the outbreak of World War II in Europe it flew patrols over the Atlantic Coast searching for German U-boat activity. Deployed to Borinquen Field, Puerto Rico in late 1940, the unit was assigned to the Caribbean Air Force, 25th Bombardment Group. The unit was called to face possible action, with its sister 1st Bombardment Squadron, in April and May 1942, however, when it patrolled the Vichy French Martinique area. By 1 November 1942, the squadron was transferred (minus personnel) to Edinburgh Field, Trinidad. With the Navy taking over the antisubmarine mission, the squadron moved to France Field, Canal Zone in December 1943, where it became an element of the VI Bomber Command. The Squadron carried on patrols up and down the Atlantic coast of Panama and into neighboring Colombian waters until relieved from assignment to Sixth Air Force and returned to the United States. on 2 May 1944. It moved to Lincoln Army Air Field, Nebraska where it became a B-25 Mitchell medium bomber replacement training unit under Second Air Force. Inactivated June 1944. The squadron was reactivated in 1955 as a Strategic Air Command (SAC) Boeing B-47 Stratojet squadron. It trained in air refueling and strategic bombardment operations with the B-47. In 1961, the squadron transferred its B-47s to other SAC wings and was inactivated. It was reactivated on 1 December 1961 as an Intercontinental Ballistic Missile squadron assigned to the 341st Missile Wing at Malmstrom Air Force Base, Montana. It was initially equipped with 50 LGM-30A Minuteman Is in early 1962, becoming SAC's first operational Minuteman squadron. It upgraded to the Minuteman IB in 1964 and the Minuteman IIF in 1967. 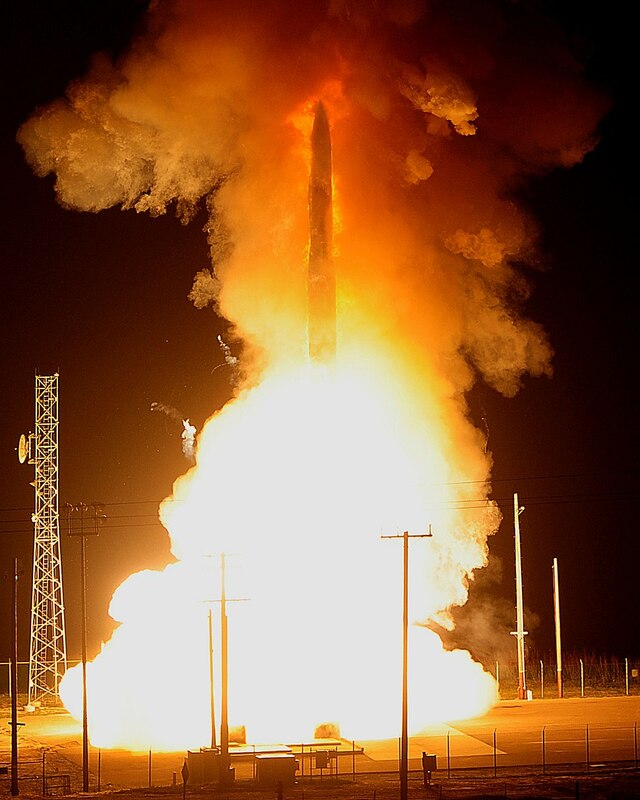 It received control of LGM-30G Minuteman III silos from the inactivating 321st Strategic Missile Wing at Grand Forks Air Force Base, North Dakota in 1996; the Minuteman IIs being retired. It has maintained ICBMs on alert ever since. ^ On an Air Force blue disc, an Air Force golden yellow demi lion rampant shaded golden brown, his tongue red, emerging from a hole dark brown rimmed red, fimbriated white five red lightning flashes radiating upward from the hole, fimbriated white. Motto: The First Ace in the Hole. Factsheet, 10 Missile Squadron. ^ a b c d e f g "Factsheet 10 Missile Squadron". Air Force Historical Research Agency. 2 January 2008. Retrieved 6 July 2018. Conaway, William. "25th Bombardment Squadron (Heavy)". VI Bomber Command In Defense Of The Panama Canal 1941–45. Conaway, William. "10th Bombardment Squadron (Heavy)". VI Bomber Command In Defense Of The Panama Canal 1941–45. No. 10 Squadron RAAF, a unit of the Royal Australian Air Force. No. 10 Squadron RCAF, an anti-submarine unit of the Royal Canadian Air Force. This is a list of the LGM-30 Minuteman missile Missile Alert Facilities and Launch Facilities of the 341st Missile Wing, 20th Air Force, assigned to Malmstrom AFB, Montana. This is a list of the three generations of ICBMs produced and deployed by the United States during the Cold War, with a fourth generation ICBM being deployed in small numbers at the end of the Cold War in 1991. Development of Intercontinental ballistic missile (ICBM) technology as an outgrowth of the World War II V-2 rocket technology developed by Germany, and the mating of nuclear weapon technology developed by the United States created an entire new method of warfare. Due to their great range and firepower, in an all-out nuclear war, land-based ICBMs would carry most of the destructive force, with long-range, nuclear-armed bombers and Submarine-launched ballistic missiles carrying the remainder. These three components were collectivity referred to as the United States nuclear triad. The United States Air Force Strategic Air Command (SAC) was the US military command and control organization for ICBMs and nuclear-armed bombers. Over a million men and women served in SAC, on daily alert 24 hours a day, with a mission to preserve the peace and deter any aggressor nation from attacking the United States and its allies. This article lists the missile squadrons of the United States Air Force. There are nine missile squadrons currently active in the United States (listed in bold type); all nine are equipped to operate intercontinental ballistic missiles.